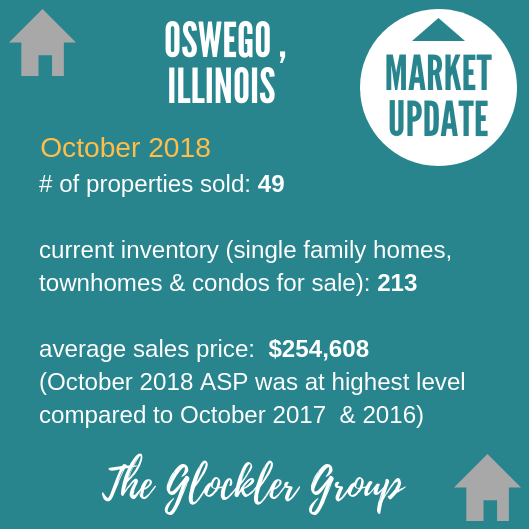 Here is the Oswego, Illinois real estate market update for October 2018. The Average Sales Price in October was $254,608, up 7.8% from $236,270 in October of 2017 and up 1.8% from $250,155 last month. October 2018 ASP was at highest level compared to October of 2017 and 2016. The Total Inventory of Properties available for sale as of October was 213, up 1.9% from 209 last month and up 19.0% from 179 in October of last year. October 2018 Inventory was at highest level compared to October of 2017 and 2016. Thinking of buying or selling in Oswego? Contact us today. What we offer clients is unlike any we know: four decades of award-winning experience, service and results. Unparalleled property marketing.